When sitting down to a Hermes 3000 for the first time, you feel drawn to the machine and your fingers want to type. The typebars strike with great precision, they’re tight, controlled, yet snappy. It’s made in Switzerland, famous for these characteristics. There’s a muted quality about this typewriter, probably due to an insulated unibody construction. This typewriter is fully enclosed, and even includes an integrated snap on shell. What is it with the Swiss and keeping a lid on things? The curves on this typewriter are delicious, it has richness and style, like you should be on a terrace in Monaco banging out your novel about star crossed lovers. The key tops have a roundness and smoothness to them that draw your fingers to touch them and use them for your desires. And if your desires are writing, lots of writing, this thoroughbred can go the distance. It’s portable, yet solid and heavy and is a substantial piece of machinery that will never let you down. Its green color imbues your words and thoughts with life. Combined with its round lines, the Hermes 3000 has an organic quality to it. It’s constructed with metal, yet feels soft. The mechanicals don’t sound harsh, due to its sound dampening design. Hermes has even designed a rubber bumper where the typebars come to a rest. If late night writing is your thing, then the Hermes 3000 will not wake the house. 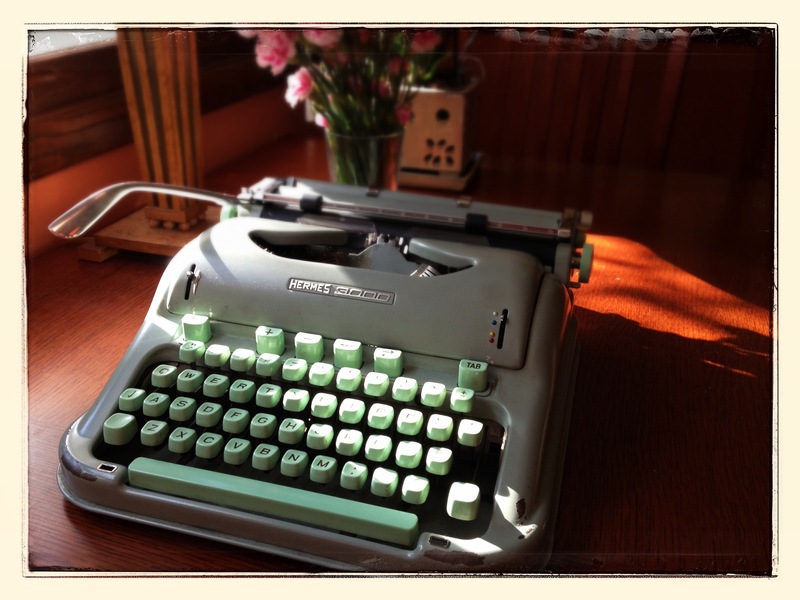 And with its ultra-chic looks, you can proudly display this typewriter all day long. Has anyone ever used a Hermes 2000? How does it compare with the 3000? Robert Messenger prefers the older version, but he almost always prefers the older version — not that I blame him. Thoughts, anyone? I have a Hermes 2000 that has an addictive quality. You don’t type as fluidly on it as on some speedier machines; it’s more like “chunka-chunka-chunk,” very evenly spaced keystrokes, but rather than that being an obstacle, you want to keep typing on it all day long. The precision may be part of it. However it pulls off that feat, it tends to pull writing out of you, which is the highest compliment you can pay a writing machine. Haven’t typed on a 3K — maybe they’re just as good.